I've always fancied spending the night on a mountain top, watching the sun set, then sleeping under the stars until it rises again. 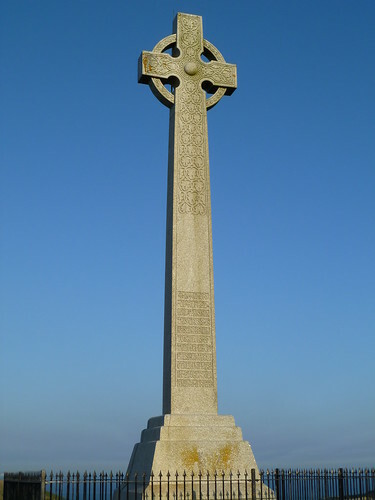 At 482 feet high Tennyson Down is hardly a mountain but it is the highest point in West Wight, and, with sea on three sides, it commands splendid views. 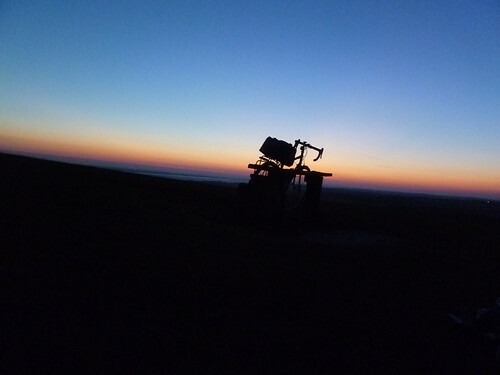 The current heat wave should provide perfect conditions – no risk of rain or cold and the bivvi bag I'd bought last year was crying out to be used. I'd been dropping none too subtle hints to Dennis since the start of the heatwave but I was quite surprised when he finally gave in and agreed to come with me. He probably realised he would get no peace until he did, and, as it is well known that mad axemen stalk Tennyson Down at night looking for lone females in bivvy bags, he was not happy to let me go alone. So we set off in the early evening, Dennis driving to Freshwater while I cycled along the south coast with all my gear in my saddle bag. The south coast is my favourite ride and with little traffic, a tail wind and a bit of a drop in temperature it was very pleasant indeed. I met Dennis at the car park in Freshwater and we walked up the down together. It would be easy enough to ride on the short grass but it is only a footpath and pedalling off as Dennis trudged up with a large rucsac would hardly be very sociable! You probably know by now that I am a bit of a gear fiend and my equipment for this trip is a gearaholic's dream – Alpkit Hunka bivvi bag, PHD Minimus sleeping bag, Thermarest Neoair mattress, Ajungilak inflatable pillow and Primus ETA stove, all fitting into my saddle bag. Dennis on the other hand had a large rucsac (mine) containing a pillow from the bed, a Poundland groundsheet, a cheap sleeping bag, 2 jumpers, an anorak and my Alpkit dirtbag mattress that I use for car camping. Who would be most warm and comfortable? We walked past a small herd of cows and headed upwards. Those cows worried me. I'm not afraid of cows but I knew if they wandered up after us they couldn't resist coming to investigate and I didn't fancy being trodden on by a cow. Freshish cow pats led towards the top, they obviously didn't always stay near the bottom. 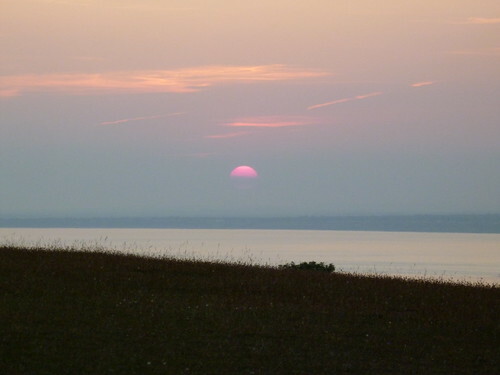 I tried to stop worrying about being trodden on by cows and concentrate on the sunset. All was going well. 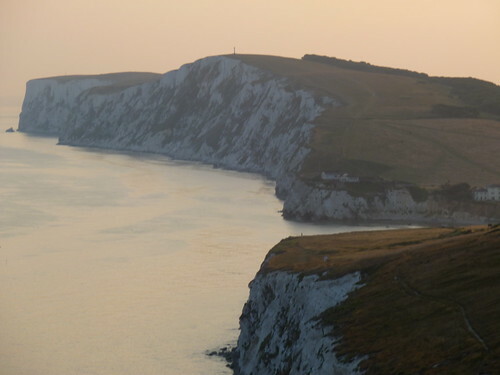 Once at the top we would sit comfortably on the benches there enjoying tea and cake and watching the moon rise higher and the stars twinkling as the Isle of Wight slipped into darkness. Well, that was the plan! As we neared the top we were assailed by a squadron of large buzzing insects. They made a beeline (no pun intended) for our heads and wouldn't leave us alone, dive bombing us and buzzing loudly. We lasted about two minutes before we turned and fled, waving our hands above our heads. Or at least Dennis did, I needed one hand to push my bike! We were almost half way down before we got clear of them. I don't know what they were. They looked like bees which seemed odd as it was going dark but they behaved like kamikaze pilots. We stopped by a small bench to make tea and recover our composure. It was tempting to just carry on down and forget the idea. So much for the bold adventurers! I'm sure Shackleton didn't behave like this. After giving ourselves a stern talking to we decided that this was as good a place as any to bivvi and set about bedding down for the night. Dennis was soon sorted. I intended to put my posh Neoair mattress inside the bivvi bag to protect it from the chalky flints that littered the down. However the bag tapered and the mattress didn't. It just about went in if I left a bit sticking out of the top so I got in my sleeping bag and tried to wriggle into the bivvi. Not only was the mattress too wide, it was also too fat – there was no room for me! I did manage to squeeze in but it was obvious that I was too cramped to ever get any sleep. I didn't want to risk puncturing the mattress by putting it under the bag so I gave up on sleeping in the bivvi bag and just lay on top of it. That was better, quite comfortable and a nice cool breeze playing round my face. Time passed, the moon rose higher, stars appeared and the gentle breeze became a cold wind, chilling my face. Dennis was snoring peacefully. 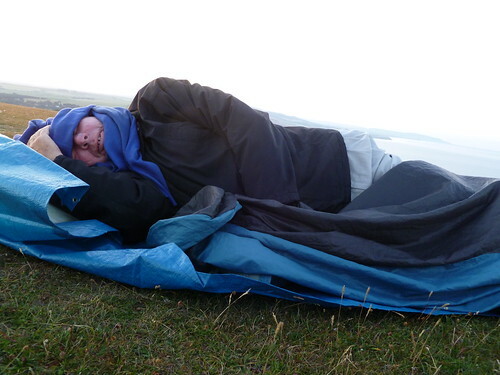 I pulled my sleeping bag round my head and eventually drifted off to sleep. A couple of hours later nature called. I crawled out to find the moon was now larger, yellower and sinking towards the horizon. Back in my bag a myriad stars shone overhead until the chilly breeze drove me back into the sleeping bag hood. 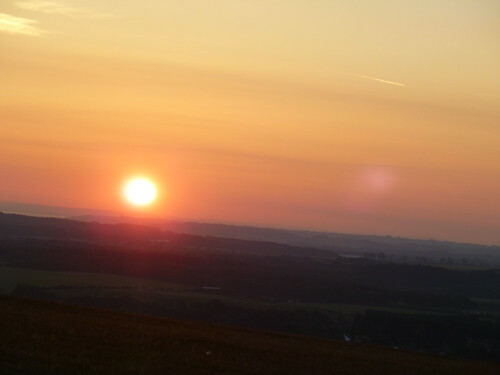 When next I stirred it was just coming up to 4.00 am and there was a slight orange glow in the sky. I lay in my bag and watched the sun rise. Then I woke Dennis up so he could enjoy it too! It was still surprisingly cold so we gave up on trying to get any more sleep. We had a brew and finished the cakes then walked back up to the top to enjoy the early morning. The mysterious insects had gone and it was a beautiful bright day. It was still chilly so we headed back down to Freshwater Bay for another brew in a rather more sheltered spot. We were also killing time until the Hong Kong Express in Freshwater would start serving its cheap English breakfast. We hoped it might open at 8.00 but the sign on the door said 'Open 8.30' so we wandered off to the Sports Centre but their cafe didn't open till 9.30. Back at the Hong Kong Express it was gone 8.30 but no sign of life. Then we noticed the advert 'Breakfast Chef Wanted', it wasn't looking good. We tried another cafe but that didn't open till 9.30 either so we moved on to Yarmouth. Eureka! A cafe that was open for breakfast. What, £8.95? We're not that hungry! Finally we found one that didn't require us to take out a mortgage. If there is a next time I'll take enough food for a proper breakfast sizzle. I was still hungry as I cycled back and stopped at Brighstone Village Stores for a huge slab of bread pudding. That hit the spot. I'm afraid I missed most of that day's Tour de France as I kept dozing off! The night hadn't exactly gone to plan but we will remember it for a long time! Posted by Hilary on July 22nd, 2013. Well done Hilary (and Dennis – I always say that 🙂 ) Very nice photos. 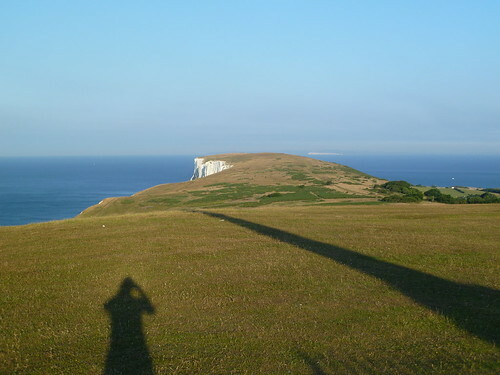 I have cycled up Tennyson Down and it's a very nice spot – especially with tea and cake to enjoy, although I was wary of the cliff edge. I have no idea what the insects could be. There is a web page here with information on IoW insects. Hoverflies maybe? PS: I like cake for breakfast but with strong sweet coffee. There's nothing quite like a night in the wild to appreciate one's home comforts. Do you ever notice how all those explorers of old didn't complain? It makes one wonder just how hard their beds must have been. Good photos, by the way. Thanks for the insect link Patrick. They were in fact Cockchafers, totally harmless 😳 but quite alarming and definitely hard to ignore when flying round your head in large numbers! LOL — No bread pudding for Shackleton, Mallory or Scott. Midges are the nastiest insects the UK has to offer but I think they are mostly northern beasts, increasing in numbers, viciousness and hours awake from Lancashire upwards. Yes, I would never have considered doing this in midge territory. A cafe that was open for breakfast. What, £8.95? We're not that hungry! Finally we found one that didn't require us to take out a mortgage. And I thought this was going to be a stirring stoving story. Tsk. Chris wrote: I don't think I would dare go bivvying. My bivvy bag is just that – a waterproof bag, but as I spent more time out of it than in its a good job it didn't rain! Lack of rain was pretty much guaranteed but I hadn't anticipated that the wind would get up. I'm starting to fancy a bivvy bag. What people will and won't do sleep-wise is often a matter of perception. The same person who sleeps on a beach in the day time refuses to spend the night in a tent. Although I have camped hundreds of times since childhood I have never really liked it and I think it's because I don't like the inside of tents: gloomy and cramped and they smell of fabric. However, the concept of a 'sleeping capsule' seems okay. With a bivvy bag (I assume) you are either inside it sleeping or you are walking about, and you never see the inside any more than you see the inside of your clothes. I might try one some time! I don't like the inside of tents: gloomy and cramped and they smell of fabric. Yes, people definitely have different perceptions! I find the inside of tents bright and cheery and I love that tent smell! 🙂 You do need a bright coloured inner – yellow or orange – dark ones can look a bit gloomy I suppose. 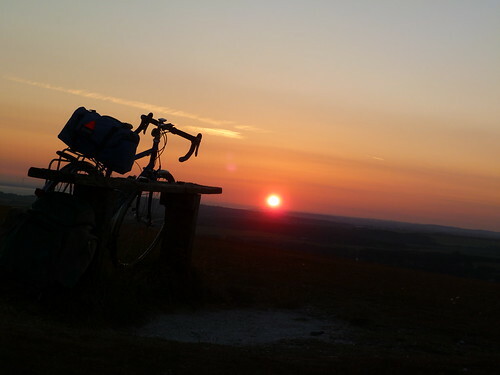 If you do want to try a bivvy bag an Alpkit Hunka is much the cheapest decent one available. It might be an idea to get the XL version. I bought mine (standard size) from a guy on the CTC forum who'd found it too small and it was a bit tight for me, a fairly thin 5'4", altho I was trying to squeeze a mat in as well. Patrick wrote: is it not just like sleeping in a very small tent with your head poking out through the door? Great write up Hilary, you are taking on Patrick for your photography skills.